Age spots. Liver spots. Acne scars. These are all forms of hyperpigmentation, which leave so many of us feeling a bit insecure about the overall appearance of our complexions. While the American Osteopathic College of Dermatology calls hyperpigmentation "a common, usually harmless condition in which patches of skin become darker in color than the normal surrounding skin," anyone who's suffered from dark spots knows how distressing this common discoloration can be. The AOCD explains that hyperpigmentation occurs when "an excess of melanin, the brown pigment that produces normal skin color, forms deposits in the skin." This can be caused by factors such as sun damage and inflammation from skin-picking and acne scarring. While there are many expensive dermatological formulas on the market to help reduce the appearance of hyperpigmentation, there are also a lot of nifty natural remedies to try at home. Let's take a look. 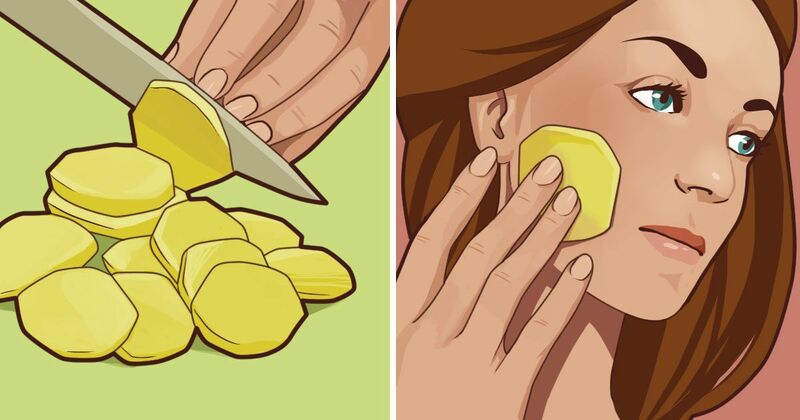 To combat the effects of hyperpigmentation, Rapid Home Remedies recommends rubbing a slice of raw potato over your face three to four times a day for up to 10 minutes at a time. If the potato feels too dry or abrasive, the site also suggest moistening the slice with water. Over time, you just may notice a reduction in your dark spots. Is there anything better than treating problem skin with items already sitting in your fridge? This may sound a little funny, but Holistic Health Herbalist explains that "yogurt contains lactic acid, a gentle but effective natural form of hydroxyl acid that exfoliates, softens skin, and lightens dark spots." To give this natural remedy a shot, apply full-fat plain yogurt directly on your skin's dark spots for 20 minutes at a time. Aloe vera is better for more than just soothing sunburns: It also contains an enzyme that helps treat dark spots. The folks at Skin Disease Remedies report that, "Mucilaginous polysaccharides in the pure sticky aloe gel removes dead skin cells and enhances regeneration of new cells." To treat hyperpigmentation with aloe vera, the site recommends peeling the skin off aloe vera leaves and using the gel-like substance underneath as a nightly mask. Skin Disease Remedies adds that you can also combine manuka honey with this aloe vera gel to effectively treat dark spots. The folks at Health Ambitions report that apple cider vinegar is a multifaceted natural formula for clear, glowing skin (they note that even Scarlett Johansson swears by it). It's particularly useful for treating dark spots, too. Just apply directly to any affected areas on the skin using a cotton ball. Health Ambitions recommends doing this regularly for at least a month. And if your skin is sensitive and direct application stings, try diluting the apple cider vinegar with water. Turmeric isn't just great for cooking; it may also completely revitalize your skin routine. Holistic Health Herbalist reports that "turmeric is a powerful anti-inflammatory" and that by wearing a face mask with just a couple dashes of the substance each week, you "will literally lift hyperpigmentation 'stains' right off." Holistic Health Herbalist provides a great natural mask recipe that involves raw honey, full-fat yogurt, aloe vera and lemon juice. What do you think? Would you use any of these DIY beauty tips to combat your own dark spots? Tell us your thoughts in the comments below and make sure to SHARE if you found these natural remedies useful!